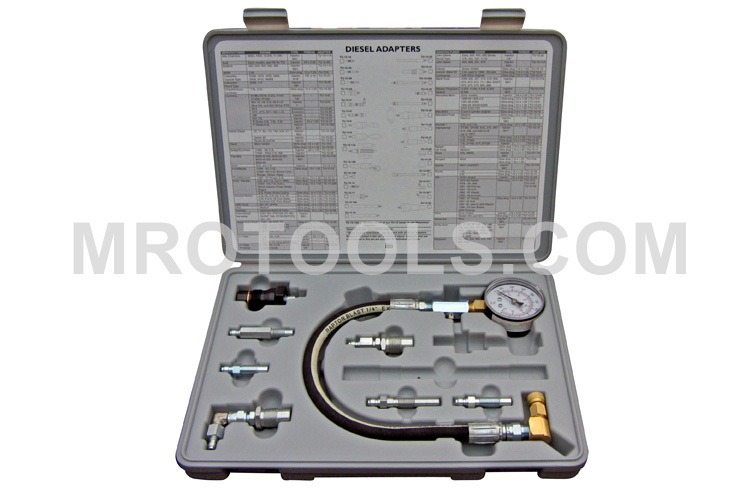 Kastar Diesel Compression Test Set is a must have for diesel work in the American market. The Kastar Diesel Compression Tester has a handy deflator for releasing air and re-testing, and A 16-1/2'' wire reinforced hydraulic hose that has a Quick Coupler on a swivel for ease of connection. The Kastar set includes adapters for GM, Isuzu, Lincoln Mark VII, Continental, Ford / Navistar, Audi, Mercedes, Peugeot, Toyota, VW, and Volvo. 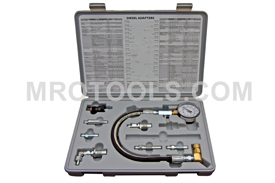 The TU-15-53 Kastar Diesel Compression Test Set is one of thousands of quality tooling products available from MRO Tools. Please browse Kastar Diesel Compression Testing Equipment for tools similar to the TU-15-53 Kastar Diesel Compression Test Set. TU-15-53 Kastar Diesel Compression Test Set description summary: Kastar Diesel Compression Test Set. This is a must have for diesel work in the American market. Includes adapters for GM, Isuzu, Lincoln Mark VII, Continental, Ford / Navistar, Audi, Mercedes, Peugeot, Toyota, VW, and Volvo Quantity discounts may be available for the TU-15-53 Kastar Diesel Compression Test Set. Please contact MRO Tools for details.